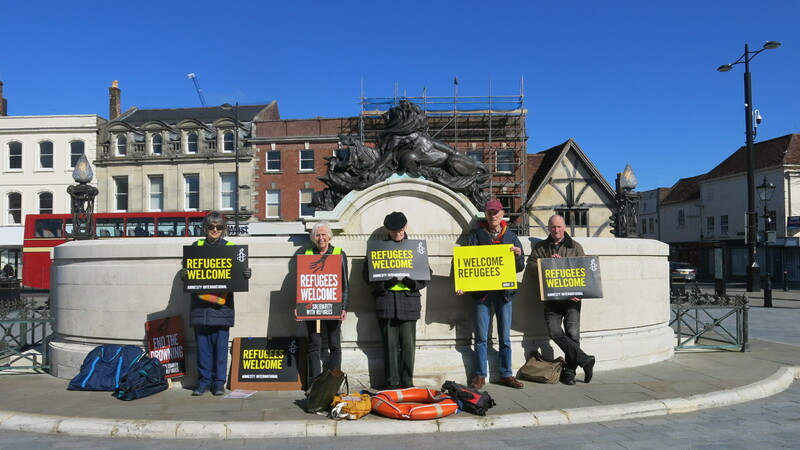 The 10th December was the 70th anniversary of the Universal Declaration of Human Rights and the Salisbury group decided to mark the occasion with a talk on the subject of refugees. This is a hot topic since one of the contributory factors which led some people to vote to leave the EU in 2016 was the worry about immigration in all its forms. At the time of the Referendum, there were nightly images of people fleeing Syria and others fleeing wars in Eritrea, Somalia and Mali trying to cross from Libya to Italy in highly unseaworthy boats. We were delighted to welcome author and journalist Daniel Trilling who began by talking about his own family’s journeys to these shores from Russia and Kiev. His grandmother had managed to leave the Ukraine and get into Poland at the time of the civil war in Russia which started just after the revolution. She made it to Berlin but had to leave again in ’39 because of the Nazis. She came Britain 3 days before war was declared. Britain was hostile to letting in adult Jews, as was the USA and Canada, and the ship MS St Louis found it difficult to find anywhere for them to disembark. There was a book and a film Voyage of the Damned of harrowing attempts by the fugitives seeking somewhere to land . Much was made recently of the Kinder transport coming to Britain but these were of course children, not adults. After the First World War, there was considerable turmoil in Europe with local wars and revolutions. The Russian revolution left many millions stateless and there were great movement of peoples as the nation states became dominant. The two main groups of stateless peoples were Armenians and Russians. The League of Nations created passports for the stateless but only between members of the League. In 1951 the Convention on Refugees was the foundation for the protection of refugees in Europe. His family history therefore was one reason why he became interested in the refugee question and in researching his book, travelled to Sicily, Greece, Calais, Germany and Bulgaria. Wars in various parts of the world, Afghanistan, Iraq and the collapse of Libya for example, have created huge numbers of people fleeing to seek refuge in another country. He noted of course that the countries most affected are often those with the least resources to handle the vast numbers involved, Jordan is a case in point. Europe has ‘militarised’ its border in an attempt to keep people out. The problem was the Dublin Treaty which makes the state where refugees first set foot responsible for them. This again puts great strain on Greece – which experienced severe financial crisis following the 2008 banking collapse – and Italy which is also under considerable financial strain. Other European nations – with the exception of Germany – are reluctant to play much of a part. In Greece, the rise of the neo fascist Golden Dawn party made life very difficult for refugees with frequent attacks. This led to people living in limbo for many years. The media he said tended to focus on the most dramatic cases, for example the boatloads fleeing across the Mediterranean from Libya. They tended to give an impression of experiences which were over quite quickly when the reality is that people live in limbo sometimes for many years. In one of the examples he writes about in his book, an 18 year old Sudanese boy lived on the streets of Athens for 3 years living on his wits. He spent some time describing the desperate attempts to hide under or in lorries. One woman lived for 5 months in Calais. Perhaps the most significant question to ask is why do people suffer such privation and take such risks to leave their homes and undertake perilous journeys to an unknown country? It is no accident that most, indeed nearly all, come from war-torn countries such as Afghanistan, Syria, Libya, Mali and the horn of Africa. In nearly all cases, western powers have played a part in the problems being experienced. Whether it be as a result of colonialization, war or exploitation of the countries’ mineral wealth, we – the rich countries – have had a deleterious effects yet do not want to take responsibility for the results. Britain has had a history in the past decade or so of treating people harshly as a matter of deliberate policy. Largely, this was as a result of tabloid newspaper stories, using biblical language to describe hoards of refugees pouring into the country and living in luxury at others’ expense. This Daily Express story (one of many) is fairly typical of the genre. Trilling also pointed out that the government had privatised asylum housing which meant refugees ended up in remoter and poorer areas. This only increased tensions. The system was adversarial and complex. There was no legal aid which has been withdrawn. Northern local authorities have the most problems but had born the brunt of the cuts. By contrast, Theresa May’s constituency, affluent Maidenhead, had no asylum seekers. On the other hand the Scottish system was more positive and humane which was encouraging he said. In answer to a question about how prejudice and hostility could be tackled, he said MPs had to face the hostility head on and not just accept the misinformed prejudice. He recommended looking at Refugee Council’s web site and Buzzfeed for better information on the subject. This was a very interesting and enlightening talk on this most difficult of subjects. Daniel’s book is called Lights in the Distance published by Picador (2018). The next meeting of the group is on Thursday 13th at 4 Victoria Road at 7:30. A talk by Daniel Trilling on the subject of refugees is tonight (10th) at 7:30 in the Methodist Church in Salisbury. It is free with a parting collection to help with our costs.